The architecture of an app is always a subject that can drive developers crazy, mainly depending of everybody’s experience. This is also true for mobile app, iOS or Android: MVVM, MVC, MVP, VIPER, which one to choose? There is already a lot of articles covering pros and cons of those patterns, I don’t think I can add anything to it. However, I’ve noticed that the best way for me to learn and challenge those patterns was to reimplement them often, like a coding routine. 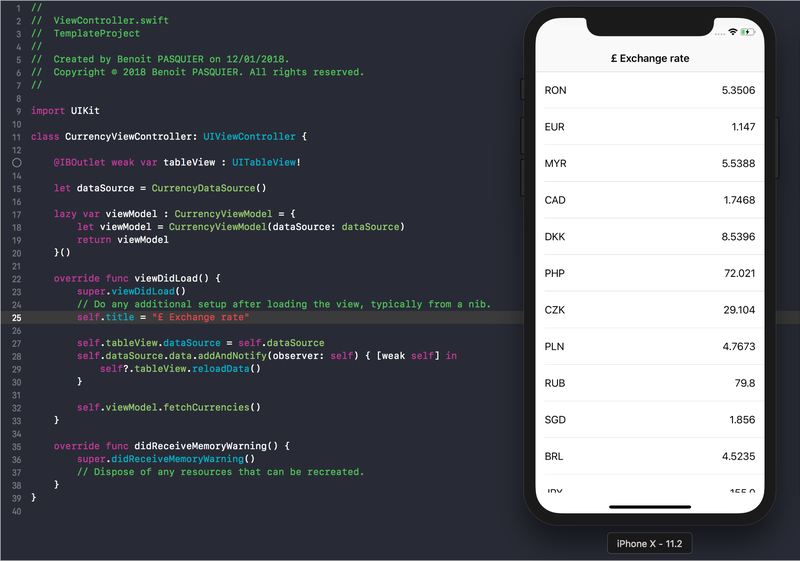 In this article, I want to share how to implement an MVVM pattern around a currency converter app in Swift. My goal is to create a MVVM template from this sample iOS app that we can improve and reuse over the time. I used Foreign exchange rates and currency conversion API for an easy api to test, displayinh latest exchange rates in a tableView. Before diving in the code, here is a quick introduction to this pattern. MVVM stands for Model, View, ViewModel, a specific architecture where the ViewModel stands between View and Model providing interfaces to imitate UI component. This connection is made by “binding” values, linking logical data to the UI. In an iOS app, the View element in this MVVM approach is often the UIViewController itself. The benefice of this approach is that the code becomes more modular, easier to maintain and test. Let’s now get into the code. Matching with the api model, here is my two struct to start with. I also create a specific service to create an api request coupled with a parser protocol that my Converter implement. You can find those source code in the Github repo at the end of that article. This is not really MVVM related so I’ll move on straight to our ViewModel and the binding system. First, to be able to bind values from our ViewModel to our View, we need element with an observable pattern. In iOS, we could use KVO pattern to add and remove observers, but I think we can do a bit better with “didSet” observer. Let’s remember that we want to execute a specific code overtime that a value has changed. We can also assume that our object can have multiple observers that are waiting for updates. To do so, I created a class keeping a dictionary of observers and their code (here a closure) that we want to execute when updated. Here what it looks like. For my example, I wanted to separate the ViewModel to the data layer. For that reason, I create a generic dataSource that we can reuse regardless the data we would like to update. Now we can implement our ViewModel, able to fetch currency exchange rates and updating its dataSource once fetched. To make it safer and easier to test (by dependency injection), my CurrencyViewModel will not own the dataSource. weak var dataSource : GenericDataSource<CurrencyRate>? On the other side, let’s create our dataSource that would be binding to our view. If tomorrow, you want to change the UI for a UICollectionView, the ViewModel wouldn’t need to be update, we would have a great separation of concern. @IBOutlet weak var tableView : UITableView! self.title = "£ Exchange rate"
Another trick here is that by using addAndNotify the observer is added and updated at the same time, our tableView will be reloaded, therefore our UI will be built at the first launch even without data. In conclusion, we finally have our MVVM approach completed: each layer is separated, making it easier to use, to maintain and to test. It’s also more readable, our files are made of 50 lines of code in average. I omitted some bits in this post that I didn’t feel it was fully relevant to the pattern itself, like my services to handle api request, parse and handle exceptions. This whole sample iOS app is available on Github. At the end, I believe that testing and challenging patterns are the best way to make your own idea of it. It’s a good way to be more confident in your code. On the other hand, I wouldn’t rely on one solution only, ignoring alternatives, that is also why I created that template: I can reuse and rethink of it as soon as a new project popped in my mind.